Accessory Genie - Consumer Electronics and Accessories Industry News: Tech Protection! If you're like me, you take your tablet everywhere; to the beach, on road trips, walking around at the mall…everywhere. The only problem is when I am not using my tablet; I have to carry it in my hands which I could be using for other things. 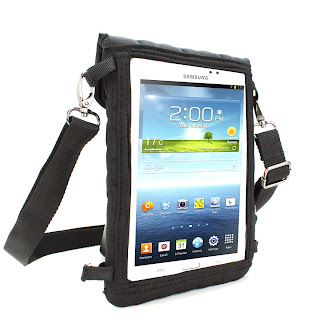 With the FlexARMOR X, I can just drop it to my side when my tablet is not in use! The FlexARMOR X is a light weight flexible casing that grants the user open hands to perform other tasks when not using their beloved tablet! The FlexARMOR X features weather-proof, reinforced impact-resistant Neoprene that helps absorb shock from dings and bumps, while also withstanding the abuse from daily wear-and-tear. The rugged, yet flexible, material of the FlexARMOR X fits like a glove, snugly conforming to your gadget's shape while the padded texture cushions your device like bubble wrap. The play friendly design of this case features a fully-capacitive screen protector that allows you to use your tablet's touch screen while protecting it from dust, fingerprints, spills and more! Going on a road trip? The detachable strap can be used to mount your tablet to the back of a car seat, allowing you to share with your backseat passenger or create your own personal theater! The USA Gear FlexARMOR X is on sale now for just $12.99 with the newsletter code.